A Cocker Spaniel guarding food and chews — Havers Dog Behaviour. 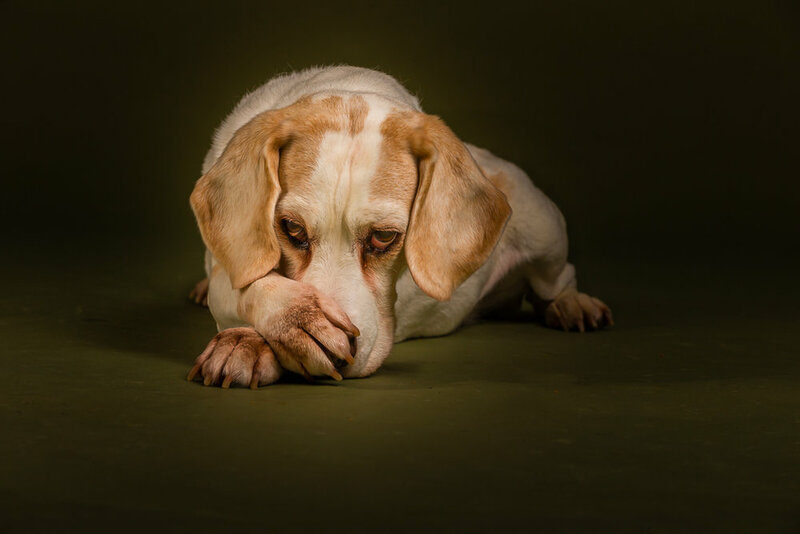 When a dog is guarding and it doesn’t matter what they are guarding they can easily scare their family as the noise they make when guarding can be very intimidating, scary and confusing. They guard resources, they guard toys, they guard certain people in the family and there are many more reasons dogs guard, some are bred to guard, the lovely German shepherd for example is a naturally protective breed and these breed straits sometimes need to be carefully managed. But the Cocker spaniel isn’t a breed that was created to guard so why has this behaviour developed? Every dog is different but in this case in a house with two adults and three children we were looking at the possibility of over stimulation. This might not sound like much, from our point of view it isn’t much but for a dog it can be a really big deal. If a dog is over stimulated, that means it gets nearly all of its attention from being excited and doing stuff with the family, it is very difficult to get any downtime. Especially of the family perceive downtime as the dog is bored and therefore think they have to be entertaining or playing with their dog. This can create an belief in the dog that the approach of a person will always mean elevation and stimulation and there comes a point where the dog just wants to relax and be quiet, especially in the evening so the dog had started growling at people when they came into the kitchen where the dog was trying to relax. Respecting a dogs space and wishes can be difficult for us which is why sometimes a dog is forced into desperate measures to try and communicate their needs. The dog was also a food stealer and would jump up to the kitchen work tops when food was being prepared and would bother the family when they were sitting at the dining table eating a meal together. There was a tray of home baked cookies on the kitchen side. One of the children had the perception that treats would always over power attention as a reward so with the tray of cookies we did this…. 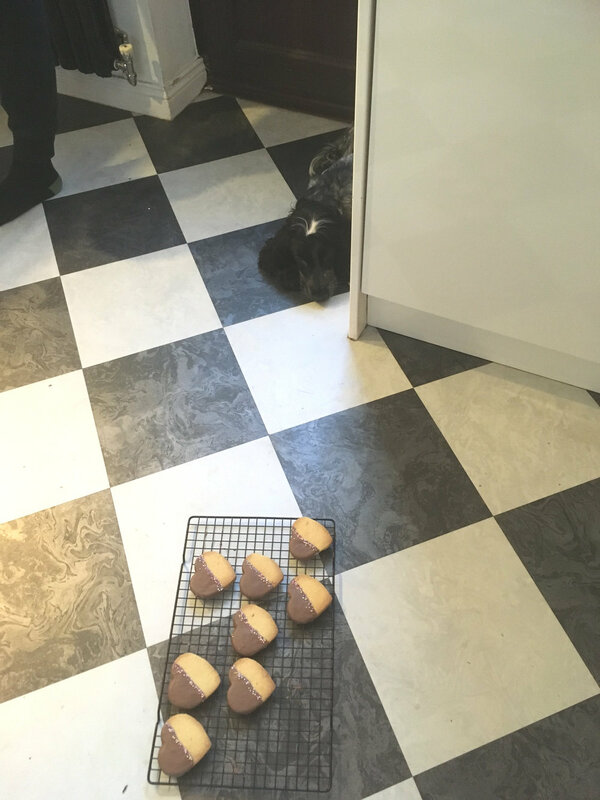 The photograph was taken on my phone so it isn’t the best but you can see the dog lying down very close to the tray of cookies that are on their cooling tray on the floor. The dog was interested, obviously but made no attempt to get a cookie because of the praise being received for not doing something. The dog would also guard the food bowl, would carry the bowl around and when anyone walked towards the dog and the bowl, there would be a great deal of growling. We get easily confused by the noises a dog can make as we easily associate growling and barking with aggression and whilst this can be the case, more often it is the dog trying to communicate to get you to realise the dog is not happy, is not coping or just does not like something. Vocalisation of communication in a dog means the earlier, non verbal attempts to communicate have not been spotted, they can be very subtle and if we are not paying attention and observing our dog, they are very easy to miss which is why dogs end up having to make a noise as they quickly realise we don’t ignore noise, we tend to react to it. So a dogs growl can generate the opposite of the dogs intention. If a growl is used to communicate, it provokes a reaction in us of fear, confusion and reaction which is usually the exact opposite of the dogs intention. If the dog is asking for peace and quiet, very often the opposite follows a growl which further agitates the dog who feels the need then to further make their point so they growl louder or they bark. This can further escalate our reaction and behaviour as we become more stressed and vocal which again further escalates the dogs behaviour and so it goes on if left unchecked. So we went through feeding time and sure enough the dog carried the food bowl around whilst growling, took the bowl to the dogs bed and continued to growl and being very tense. After quite a while however, because the reaction of the family was very different, the growling stopped, the bowl was put down and the dog relaxed, even when people went to stand next to the dogs bed. Within an hour and a half there was a complete change in the dogs behaviour not because we trained the dog to behave differently, but because we helped the family understand their dogs needs better and we changed their behaviour which enabled thei dog to change accordingly. This will give everyone a more relaxed relationship and a far better quality of life with much less stress for everyone. Our dogs are always willing to change if they are given both the opportunity and a reason, once we give our dogs the reason and the opportunity to change their behaviour, they will. Our challenge then is continuing behaving in the right way, not the way we want to.